One of the endearing properties of a tinnie was that grazing alongside something hard seldom made any visible difference. But as aluminium boats grew up they started getting painted and that advantage largely disappeared. Coraline, however, has always offered the option of deleting the paint – with a cost saving – and today’s review boat has an interesting compromise. For a 5.8m hull the Coraline’s 2.5m beam is substantial – there are eight-metre boats around that are no wider. Beam is especially useful to a walk around, where you have to provide useable side decks as well as room for seats that you can walk between. Beam can be good for stability too, especially useful on a boat with room for so many anglers. To accommodate the beam, though, boats in the past have needed shallow deadrise to keep the chines in the water. The Coraline’s hull has been redesigned with all the tricks like reversed chines so that stability when stopped is balanced with a good ride when moving. There is plenty of deck area, all carpeted, and 100 percent of the perimeter is available for fishing. In the midst of it is a cabin that is a lot more than an overgrown centre console. It has useable seating, space for a chemical toilet, and a zippered door. And it provides a high level of shelter for the driving position. 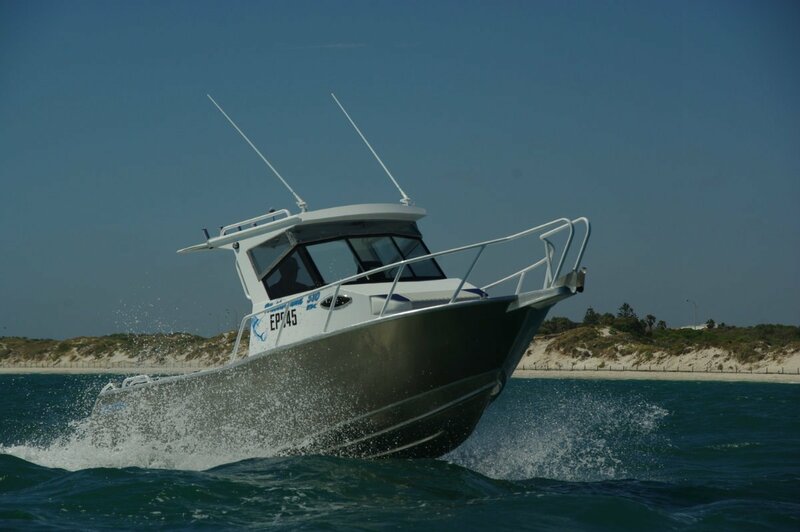 The metalwork combines with a typically massive Coraline windscreen structure, and a lined open hardtop with extension and clears to guarantee dryness for at least two on board. Those two are mounted on good swivel seats on top of lockers. Two more can sit on a seat ahead of the cabin and another three on the settee aft. Like the hardtop’s extension this is removable to maximize fishing room. A boat with this much space, all of it useable, needs plenty of security for people moving around, and the Coraline has it. Side rails, vertical and horizontal grab rails, and rails along the hardtop that can also be used for tying down roof loads like surf boards or kayaks. 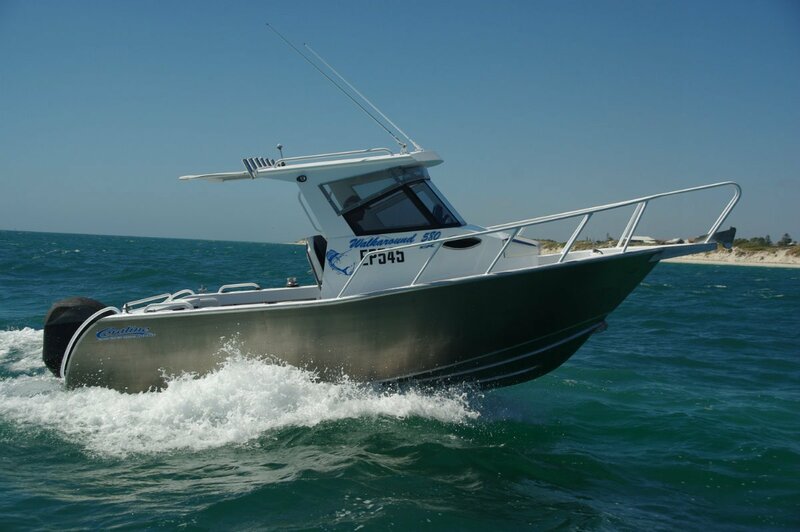 Purely fishing features include a catch or ballast tank, rod holders in profusion, a deck wash, and even a coaming mounted pot winch and tipper. A feature I particularly liked was the twin battery set-up housed in the transom lockers. 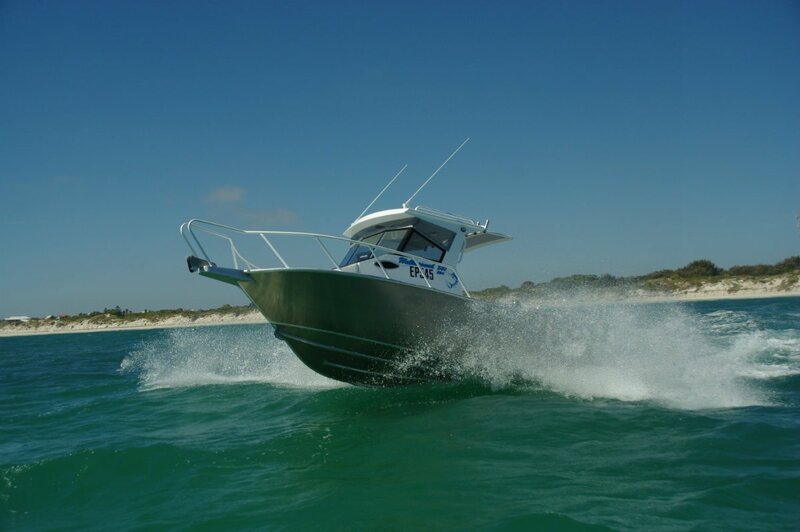 Outboard motors are now remarkably reliable and, alongside running out of fuel, almost the only problem they are prone to is running out of electricity; in other words battery neglect. With two, the odds are on the side of even an owner slack on maintenance. The motor fitted was a 115hp Yamaha four-stroke. This was a good match; it would be a pity to drop down in size, and probably not much would be gained by going bigger. 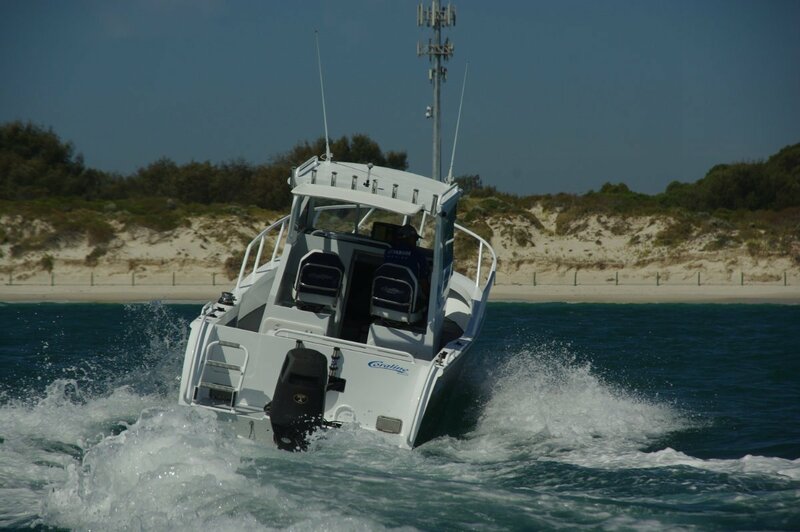 We had realistic weather to test motor and boat, the kind a lot of fishing takes place in: flat enough for a pleasurable day and lumpy enough to encourage careful throttle and trim settings. There were no surprises. 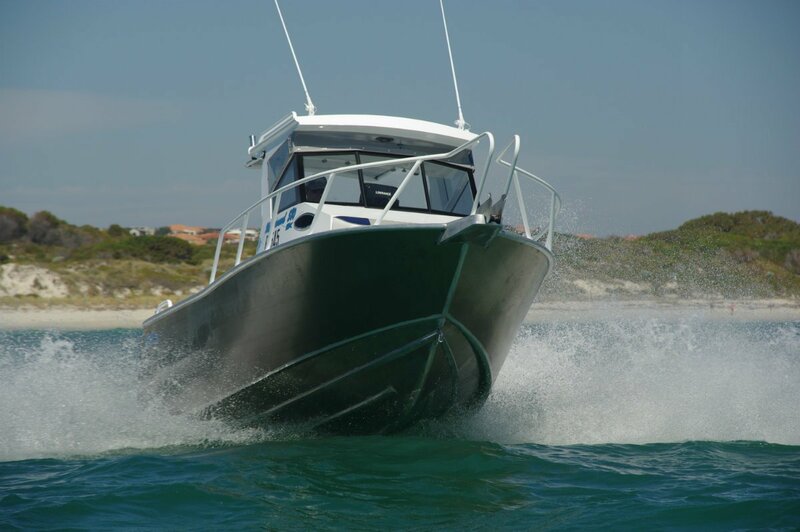 The hull was able to cope with a wide open throttle and still deliver acceptable comfort. Drop back a few revs and we had a speed we could hold all day. Select neutral and here was a rock steady platform. What more can you ask of a boat? Perhaps a trailer tailor made for effortless driving on, and that is what we had.